My girls stay stuffed up pretty much all cold and flu season. Adding eucalyptus into your Winter play is fabulous for opening up the airways and helping kids breath. You can add a touch of this essential oil to your paint, make soothing cloud dough, add a bit to the bath, and so much more. Here I whipped up a batch of Eucalyptus sensory rice for the girls to play with. 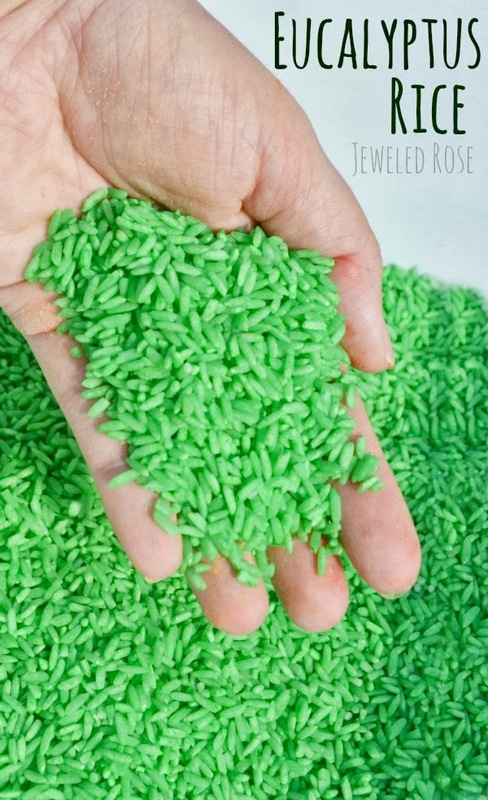 This rice is very easy to make and really helps clear the girls airways, all while they PLAY! Add the desired amount of rice to your zip seal bag. Add food coloring along with a few drops of eucalyptus essential oil and a bit of water. 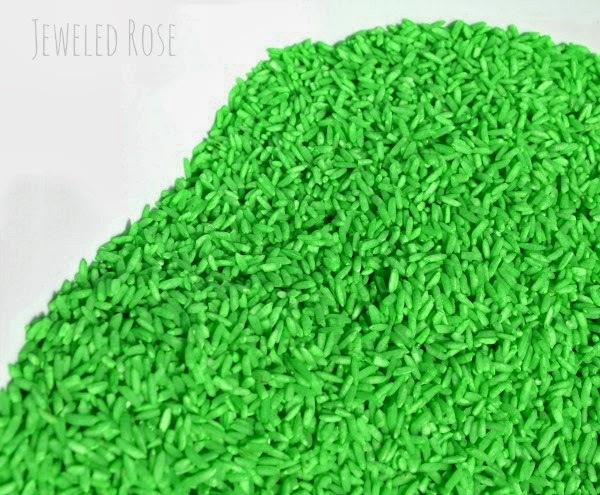 The water just helps the coloring spread onto the rice. You want to add enough to saturate the rice without having a lot left over in the bag. Tightly seal the bag and mix the ingredients well. Kids love helping with this part. Once the rice is mixed you can leave it right in the bag to dry. Just make sure that you leave the bag open. 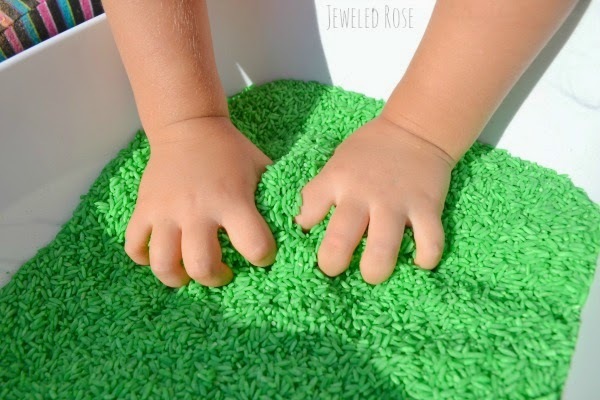 You could also use the rice to make a fun themed sensory bin. 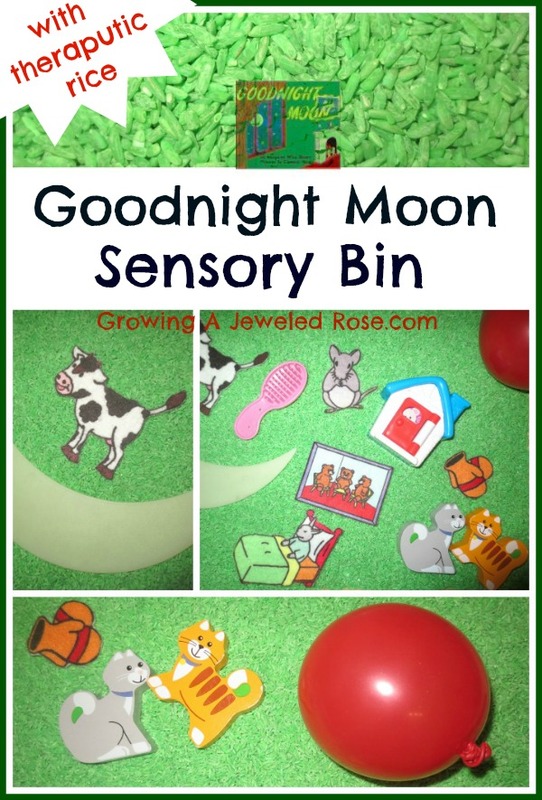 I made a Goodnight Moon sensory bin to go along with one of Rosie's favorite books. We still had everything gathered from when we did a Goodnight Moon Bath, so it was really easy to throw together The green rice made a prefect great green room. When we put together the Goodnight Moon bath we raided our toy collection to find objects from the book- kittens from a wooden puzzle, a toy mouse rattle, a baby doll brush, etc. I am sure if your raided your own toy collection you could find many of the objects from the book as well. We also have the Goodnight Moon Felt Figures that we use to bring the book to life on our felt board and used them in the bin. We put the sensory bin in our quite corner where Rosie and Jewel have reading and time out time. We have been reading Goodnight Moon each night before bed while Rosie and Jewel play in the Eucalyptic sensory bin. It has really been helping clear their airways before bed, and in turn, helping them to sleep better. If you don't have eucalyptus essential oil you can find at most major department stores, pharmacies, or online here . The bottle lasts a really long time, making it well worth the investment for the colder months. Adding a bit of soothing aromatherapy to play is such a simple way to calm and sooth little ones. We have lots more fun therapeutic activities to share. 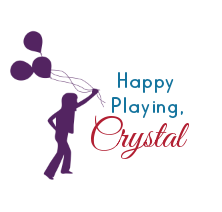 Connect with us so you don't miss the fun!